Out on of my daily runs around the sidewalks in Kelowna, a surprising thing happened to me the other day. I’ve got used to my usual daily slog in the Okanagan heat. The longer runs can be something of a strain in the mid-thirties sun, sometimes without too much shade whilst running alongside the local orchards. One thing they certainly do offer is a challenge. This late afternoon heat saw me jogging along Gordon Drive, a main highway into the city of Kelowna and, at least in my eyes, a fairly unlikely place to spot wildlife, even in Western Canada. I should really know better. With perspiration in my eyes I inspected the sidewalk where my feet would next step and saw a sharp movement. Sitting there on the light grey paving was an 18″ Garter Snake looking up at me. Now I’m not going to pretend that such a reptile is a killer. It’s renowned as a ‘Garden Snake’ in Canada as they are far from rare. Most Canadians will have a seen one or two over here and there it should be said. Nevertheless snakes are something of a mystery to me. That’s probably the reason I, like many, am pretty scared of them. You know that s-shaped ‘slither’ that snakes do when they move? That’s what this one did. Away from me thankfully. Seems like the snake would have been as scared of me as I of it apparently and off it travelled at a fair pace into a lucky neighbour’s garden. 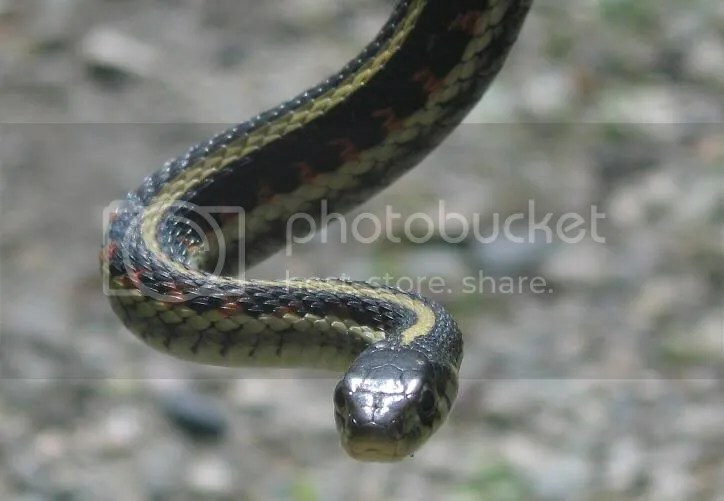 The Garter Snake has a few variations according to geographic region but in the Okanagan region they are generally dark grey/black to view, with white stripes down the length of the sake which appear like ‘garters’. They grow to around two feet. Being a bit out of things near the end of the run, and not being overly fond of snakes, I didn’t stop to attempt a closer inspection. I just kept on running. Yes I know I’m a coward. The scariest creature that’s ever confronted me whilst out running though has probably been a wasp. You can see my problem.